Learn Social Engineering: Learn the art of human hacking with an internationally renowned expert will equip you with a holistic understanding of social engineering. 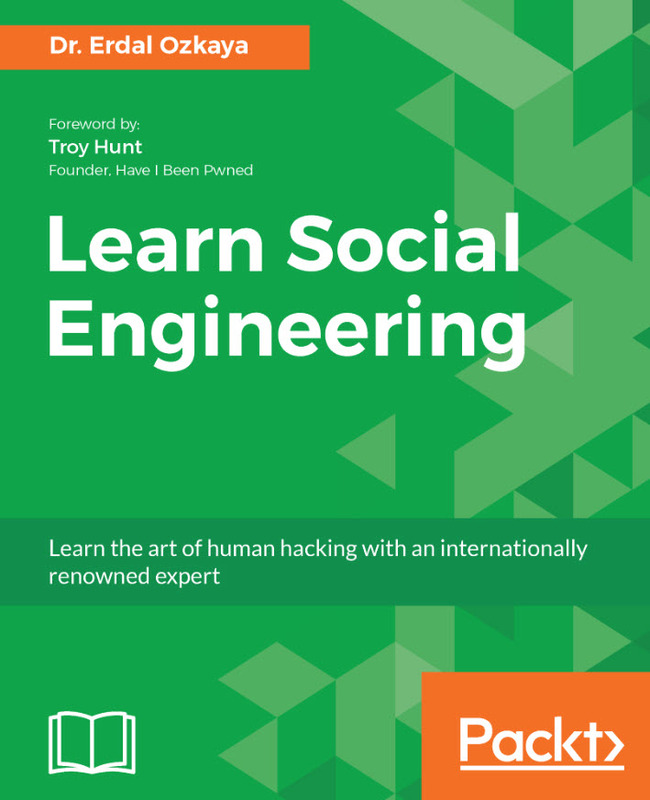 It will help you avoid and combat social engineering attacks by giving you a detailed insight into how a social engineer operates. The book covers topics ranging from baiting, phishing, and spear phishing, to pretexting and scareware. Learn Social Engineering starts with a comprehensive explanation of the concept of social engineering, which isn’t a topic that is discussed enough in the cybersecurity community. We frequently discuss phishing attacks but often avoid mentioning non-technical methods used to gain information to successfully execute a spear phishing attack. After several chapters discussing the motives behind and psychology of social engineering, the book moves to recon methods, targeting, and pretexting. I found these chapters exceptional. The entire book is well-written and well-researched, but the ability to distill difficult concepts in a manner that even a non-technical individual can comprehend is a skill. It’s easy to make things hard and hard to make things easy, is the conventional wisdom. After the baseline of the first chapters, we move into the actual technology and tooling for social engineering, using screen shots, known attacks, and concrete examples of the tools in action. The author discusses emails, social media, phone calls, texts, etc., as means of gathering information to launch a successful social engineering attack. He does a good job describing the tooling and its use without opining about the quality of the various methods. It is a very non-biased and academic approach, which I found refreshing. The final chapters in this book, however, are the most impactful. Having established the psychological baseline and defined social engineering and the attack methods, the author rounds out the content with expert opinions. Opinions by experts like Troy Hunt lend tremendous credibility to the topic. Because the author is based in Dubai, there is not a tendency to only have a U.S.-centric view, giving the book broader appeal. He finishes with needed reference material and source information. This book should be required reading for current cybersecurity professionals and anyone exploring a career in cybersecurity. The ability to craft the story for comprehension at all career phases is consistent throughout the book. In addition, the author is thoughtful in his coverage of the wide range of topics needed to adequately discuss social engineering. He makes certain to address the technical and non-technical aspects, as well as motives and victim impact. As an industry, we spend a tremendous amount of time discussing technology to defend attacks. We spend not enough time openly discussing the motives and non-technical methods of attackers and the actual cybercrime industry. We have a bias toward STEM graduates that needs to be challenged. I find that some of my most capable incident response folks are not STEM graduates; rather, they have a background in law enforcement, military or the intelligence community. We need to understand that cybersecurity is truly cybercrime and be able to construct a team of defenders that not only understands security tools and technologies but can actually lead an investigation from start to finish. This book is a key part of that learning. Erdal is a colleague of mine and asked me to read this book. I did so, at first, out of a sense of duty. By the second chapter, I was grateful to HIM for making the request. It is one of the better books I have read on the subject because of the ease of understanding and the depth of content. 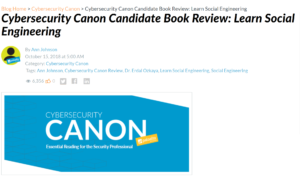 I tend to read a lot of cybersecurity books that you simply cannot comprehend without many years of experience in the industry, specific tooling or knowledge as a security researcher. There is a place in the industry for books that give readers an understanding of attacks through tangible example, but also an understanding of the motives of the attackers. This book covers both. I would place Learn Social Engineering in my “Top 5” list of books I have read this year — and yes, I’m a voracious reader. I would highly encourage everyone to read it. It is an easy read, and despite your experience, you will learn something. Ann Johnson leads the Cybersecurity Solutions Group within Microsoft , in their mission is to accelerate customers’ digital transformation with trusted solutions and expertise to build the secure modern enterprise. Before joining Microsoft, Ann was CEO at Boundless, an open source geospatial software and services provider. Prior to Boundless, Ann was with Qualys, Inc., as president and chief operating officer, a provider of cloud security and compliance solutions that enable organizations to identify security risks to their information technology infrastructures, help protect their information technology systems and applications from cyber-attacks and achieve compliance with internal policies and external regulations. Prior to Qualys, Ann was vice president of World Wide Sales/IPV and Global Accounts at RSA Security LLC, a subsidiary of EMC Corporation which provides solutions to protect customer online identities and digital assets. Ann is a recognized cybersecurity industry leader with a proven track record for building and leading high-performing global enterprise software operations. Ann has a background in cybersecurity, infrastructure and storage and is a frequent speaker on topics of online banking fraud, information security, healthcare security, mobile security, privacy and compliance. Ann is a graduate of Weber State University in Utah where she completed a dual major in political science and communications. Ann is passionate about horseback riding, skiing and any water-related activity as well as cooking and organic gardening.